UFO SIGHTINGS DAILY: Secret Lunar Base Revealed by Former NASA Astronaut, June 2016, Video, UFO Sighting News. Secret Lunar Base Revealed by Former NASA Astronaut, June 2016, Video, UFO Sighting News. Here is a great discovery by Mars Moon Space TV of Youtube. It shows many circular white structures to the far left of the module. This is a cool discovery. I have said that there are white ceramic-looking structures on the moons surface and other planets and moons in our solar system. Very cool discovery that needs to be looked into deeper. 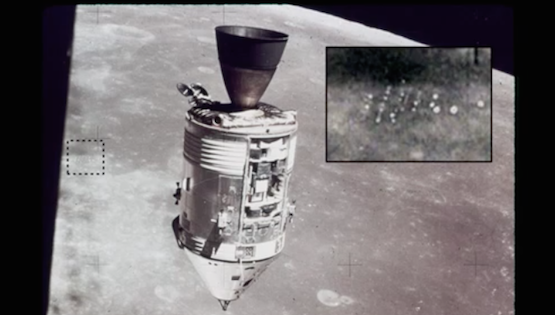 Lunar Base revealed in Apollo image. Ken Johnston Sr Civilian Astronaut Consultant Pilot, Has revealed parts of his private collection from his time serving the Apollo missions. 1 of the images showed us this ! What looks like a base on the moon with visible lights and structures. All credits to Ken Johnston Sr and Bret Collin Sheppard.